George Mason University School of Art is proud to host Emilie Brzezinski: NATURAL FACT, a survey of the Virginia sculptor’s 40 year career. Brzezinski is best known for towering arrangements of twisting chainsaw carved tree trunks which exploit the modernist maxim “truth to materials” to surprising expressive effect. This exhibition brings together examples of her signature tableaux alongside works from earlier periods in materials such as latex and resin. “Much of the material that has gone into the creation of this show originated in Virginia and so it’s a pleasure for me to display the work here, especially at an up and coming university that places value in the arts.” Brzezinski said. One sure feature of the show will be High Point, a monumental 15foot oak that greets visitors just outside the gallery’s already seemingly large barn sliding doors. Another highlight will be Children’s Arch, a nearly 12 foot tall gateway sculpted from three trunks of gum wood; Brzezinski created the arch in 1991, yet this is its first public exhibition. CHICAGO, September 4, 2015 -- For the first time since 2010, sculpture by Emilie Brzezinski will return to Chicago for a solo show at downtown’s Gallery 1112 of the Society for Arts. “I am always gratified to show my work in Chicago because of my shared central European ties with the city,” Brzezinski said. 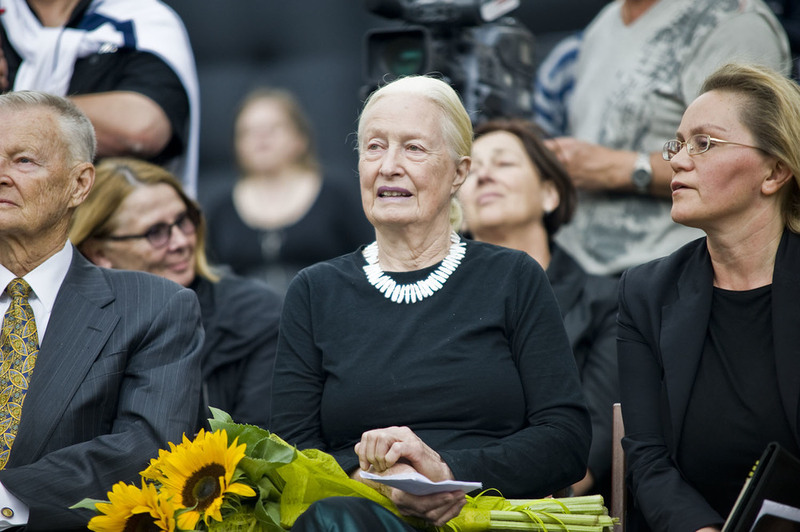 “The Society for Arts was instrumental in putting together the European tour of Brzezinski’s Family Trees in Dresden, Gdansk, and Prague in 2012/13. Today, we are happy to welcome the important artist and her award-winning sculptures back to Gallery 1112,” said Christopher Kamyszew, Executive Director of The Society for Arts and curator of the exhibit. The exhibit, titled “Old Medium, New Tools”, will feature four installations by Brzezinski who is renowned among leading sculptors in the wood medium. Brzezinski’s sculptures, often characterized by their monumental size, lack the geometric, mechanical, and linear components that some artists employ today. On the contrary, Brzezinski’s works are raw and natural in form and illustrate the process that is so important to her through her use of chainsaw, ax, and chisel. The works shown in Gallery 1112 will be no different. imperfection and specificity; respect to this persistent individuality in natural form is the underpinning of my work.” Brzezinski said. One highlight of the exhibit exemplifies Brzezinski’s favorite natural feature of trees, the contrapposto form. In 2003, White Oak Verticals was the recipient of first prize for sculpture at the Florence, Italy Biennale. Two other works will make their exhibition debut at Gallery 1112: Cherry Breezes, and Water Garden. The last work that will be on view is Brzezinski’s Cherry Bench II, which most recently was shown at The Phillips Collection in Washington, D.C.
Old Medium, New Tools: A Contemporary Wood Sculpture Exhibit by Emilie Brzezinski will run from Sept. 24 – Nov. 1, every day of the week from 12:00-6:00 pm except Mondays. For more information about the exhibit, please contact the Society for Arts at 773-486- 9612 or societyforarts@societyforarts.com. For inquiries about Brzezinski, please contact Brzezinski’s publicist, Joseph Fons, at 703-957-8624 or joseph@thelureoftheforest.com. The exhibition is sponsored in part by Star-tech Glass, Inc. and Jordan's Food of Distinction. WASHINGTON, D.C., November 10, 2014 -- A luncheon commemorating the sculpture, Arch in Flight, was held today at the Federal Reserve building on Constitution Ave. The work, created by renowned wood sculptor, Emilie Brzezinski, is located at the entrance to the Federal Reserve building on New York Ave. It is on loan to the Federal Reserve System for the next two years and is highly visible by the public because of its central location and proximity to the White House. Arch in Flight, initially a work composed of cherry wood completed by Brzezinski in 1989, now rests in bronze. Standing at 14 feet in height, the work brings to mind a larger than life representation of the mathematical symbol for pi. Closer examination of the piece, however, reveals the detailed and distinctive markings that Brzezinski left in the cherry wood using her axe, chisel, and chainsaw so many years ago. Arch in Flight is not the only sculpture of Brzezinski’s currently on display in Washington. A large-scale exhibit featuring 16 of Brzezinski’s wood sculptures is on display in northwest Washington’s Kreeger Museum. The exhibit, which recently received positive review from Washington Post art critic Peter Kennicott, will run through December 27, 2014. For more information about Brzezinski and to see all of the works spanning her 30+ year sculpting career, The Lure of the Forest: Sculpture 1979-2013, a monograph cataloging her entire oeuvre, is now available for purchase. WASHINGTON, D.C., September 16, 2014 -- A large solo exhibit of sculpture by artist Emilie Brzezinski opened to the public at Washington D.C.'s Kreeger Museum today. The exhibit, titled "The Lure of the Forest", is a collection of more than ten installations of Brzezinski's maple, oak, cherry and poplar wood sculptures and hanging bark print. Ranging in size from her musical Temple Bell xylophone-like hollowed branches, to works of great magnitude like her towering 15-foot-high, three piece installation, Lament, "The Lure of the Forest" exhibit has installations even the non-artistic mind can appreciate. After all, it is not every day that you find a chainsaw-wielding 82-year-old who takes to felled trees in order to sculpt monumental compositions. 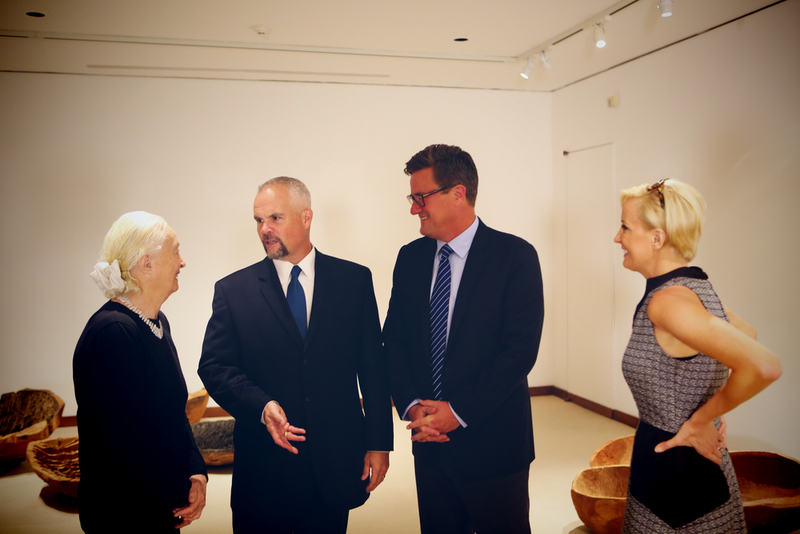 It is for this very reason that Stihl Inc., the number one selling brand of chainsaws in the world, took favor to Brzezinski's artistic process and chose to sponsor the exhibit at the Kreeger Museum. 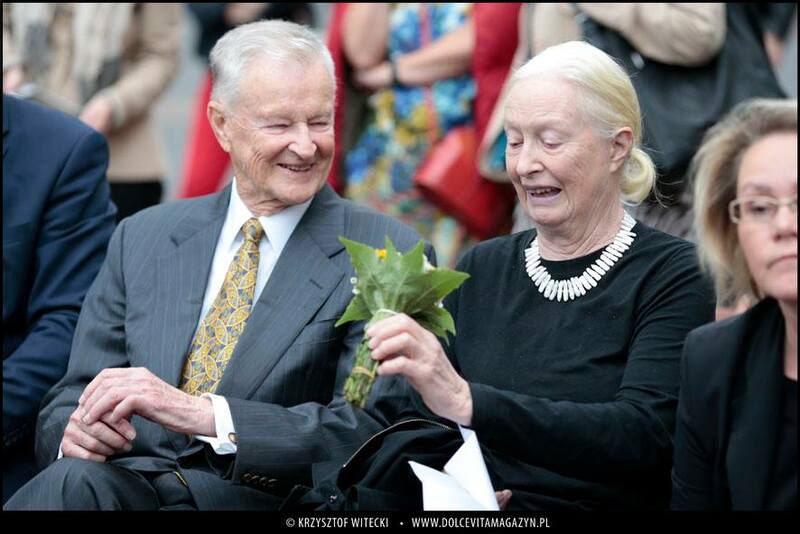 Stihl's support of Brzezinski spreads even further than the exhibit at the Kreeger Museum and in spring 2014 the German-based manufacturer will feature Brzezinski in their "Real People, Stihl People" marketing campaign. 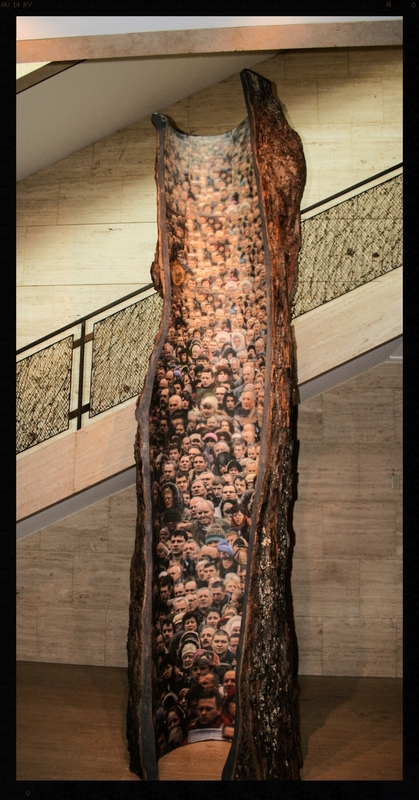 Brzezinski's talent to reveal the secret shapes, lines, hollows, and patterns of tree trunks and her perspicacity to create monumental sculpture from form that the casual observer would overlook, allowed her to create one of the highlights of the exhibit, her maple Ukraine Trunk. The work was inspired by a photograph Brezezinski found in the New York Times showing an overcrowded Kiev Square during the recent uprising in Ukraine. The image, taken by Turkish photographer Bulent Kilic, is an expressive document of the strife of the Ukrainian people and moved Brzezinski to create her monolithic trunk. The work stands in the center of a stairwell welcoming viewers to the exhibit in the lower level of the museum. Above: Brzezinski's maple Ukraine Trunk in place at the entrance to The Lure of the Forest exhibit at the Kreeger Museum. Photograph by Helen Chason. While the exhibit at the Kreeger Museum currently hosts the largest collection of Brzezinski's works outside of her own studio, it is not the only buzz of her artwork around Washington. Last week, Brzezinski's Cherry Bench II was installed in The Phillips Collection courtyard, and a subsequent program about Brzezinski's artistic career will be held there on October 1. Moreover, Brzezinski's bronze Arch in Flight greets observers just two blocks from the White House in front of the Federal Reserve building on New York Avenue. Curated by Milena Kalinovska of the Smithsonian's Hirshhorn Museum, "The Lure of the Forest" exhibit runs through December 27, 2014. For more information about the exhibit at the Kreeger Museum, including upcoming programs about Brzezinski, her recent monograph, The Lure of the Forest - Sculpture 1979-2013, visit www.kreegermuseum.org. Emilie and Mika at Politics and Prose in Washington, D.C.
WASHINGTON, D.C., June 2, 2014 -- Emilie Brzezinski discusses her book, The Lure of the Forest, with Joe Scarbourough and daughter Mika Brzezinski of MSNBC's "Morning Joe" cable news program, at Politics and Prose bookstore in Washington, D.C.
MIAMI, May 29, 2014 - Emilie Brzezinski and daughter, Mika Brzezinski, discuss Emilie's monograph, The Lure of the Forest, at Books and Books in Coral Gables, Miami, Florida. NEW YORK, April 25, 2014 – Acclaimed wood sculptor Emilie Brzezinski introduced her forthcoming monograph, The Lure of the Forest, on stage at the Huffington Post’s THRIVE Conference in the New York City Center Friday. Brzezinski was a guest speaker at the two-day THRIVE event that sought to redefine success beyond money and power and empower its participants to thrive. For Brzezinski, sculpting is what causes her to thrive. “What drives me is a dream, an idea,” she said. And so, for the first time first time in public, she shared her story. In front of a crowd of 2,000 people, the sculptor took to the stage with her daughter, Mika Brzezinski, to have a discussion about The Lure of the Forest, and her personal obsession of sculpting with the wood medium. The Lure of the Forest, which is set to arrive on bookshelves in stores across the United States in May, chronicles Brzezinski’s impressive 30-year career as a sculptor. Published by New York City publisher, Artbook, D.A.P., the book includes 200 pages of vivid imagery of the tree sculptures Brzezinski has created since the 1970s. Having officially introduced the book at the THRIVE event in New York, there are already plans for Brzezinski and her daughter to go on a traveling book discussion and signing tour. Over the course of the next month and a half both will be busy with events at bookstores and libraries in Connecticut, Miami, and Washington D.C. The audience in the theater was able to take in the full scope of Brzezinski’s tree sculptures, too. That’s because towering behind the mother-daughter duo on stage was Lament, one of Brzezinski’s latest sculptures. Composed of three gargantuan red oak trunks each weighing around 1,500 pounds, and standing at approximately fifteen feet high, this work is one of Brzezinski’s largest. WASHINGTON, D.C., November 14, 2013 - A new work by sculptor Emilie Brzezinski was installed today in front of the Federal Reserve System building on New York Avenue. The sculpture, titled Arch in Flight, is the bronze casting of a work that Brzezinski created out of cherry wood in 1989. The sculpture, which is on loan to the Federal Reserve System, will be visible to the public for the next three years. Standing at 14 feet tall, Arch in Flight brings to mind a larger than life artistic representation of the mathematical symbol for pi. Its bronze patina shimmers in the sunlight and viewers are lured closer to feel the sculpture’s textures. Detailed examination of Arch in Flight reveals that the bronze sculpture’s wood model was created by Brzezinski’s fastidious chiseling and sawed markings. Brzezinski’s respect for process is evident in the numerous chisel indentations used to create the form suggested by the growth lines of the cherry wood. As a sculptor, Brzezinski has had numerous sculpture shows including work at the prestigious Corcoran Museum of Art and the Katzen Arts Center in Washington as well as traveling shows in the United States and abroad. Next year is set to be an exciting year for Brzezinski. She will be the subject of a career-spanning monograph released in Spring 2014, as well as have a one-man show at the Kreeger Museum in Georgetown with a display of some of her more recent works. For more information about Brzezinski, contact the Artist's Publicist Joseph Fons. Arch in Flight is lifted from truck to air with a powerful crane. International Arts & Artists President David Furchgott and Artist Emilie Brzezinski observe Arch in Flight's placement in front of the Federal Reserve Building. Emilie and Mika Brzezinski pose in front of Arch in Flight before it is unwrapped. Arch in Flight unwrapped and safely secured into its home for the next three years. 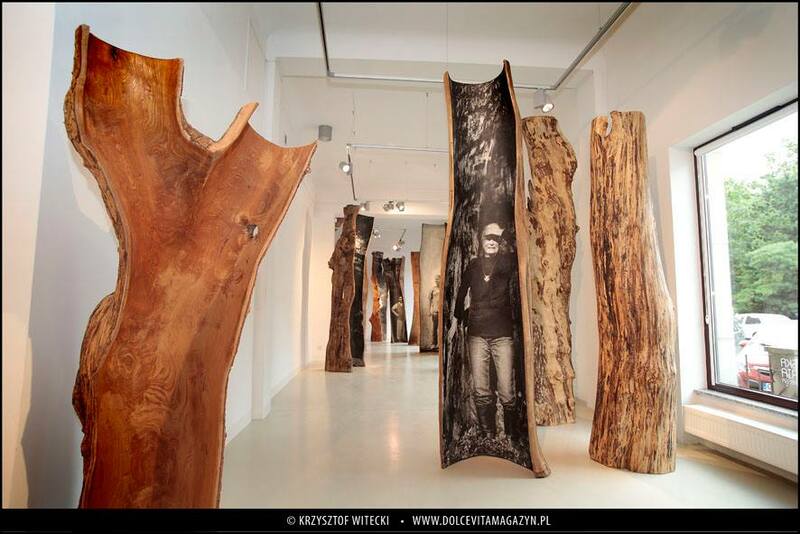 GDANSK, POLAND, July 2, 2013 - "Family Trees", a collection of wood sculptures by American artist Emilie Brzezinski, have found a new site at the Gunter Grassa Gallery in the historic district of Gdansk, Poland. This is the third stop of the "Family Trees" European traveling tour having previous exhibits this year in Dresden, Germany, and Prague, Czech Republic. 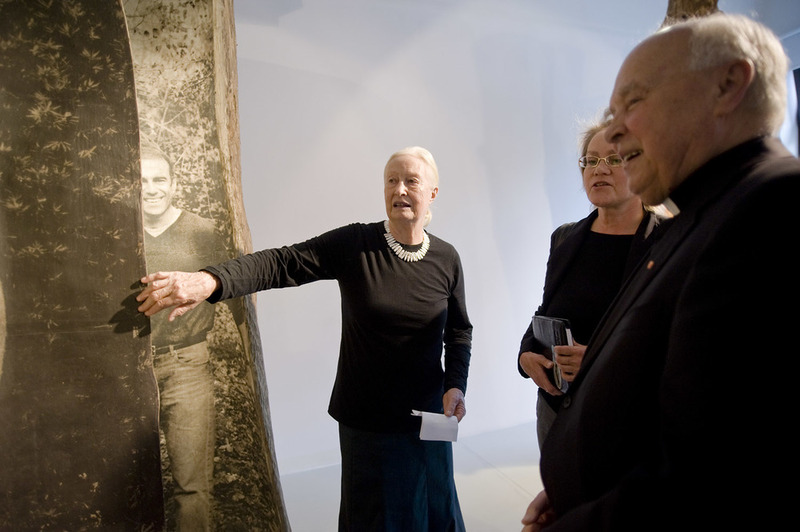 The work, which combines hollowed out tree trunks and black and white photography of the artist's family members, will be shown alongside drawings of her husband, Zbigniew Brzezinski, Former National Security Adviser under United States President Jimmy Carter. 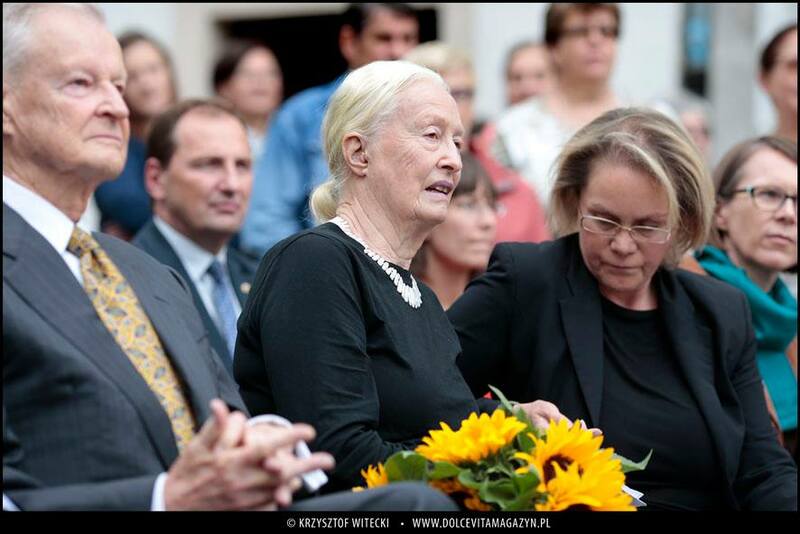 Over 200 exuberant well-wishers and several local and national media groups attended the opening reception for the installation which included remarks from the artist and also from her husband Zbigniew, Mayor of Gdansk, Paweł Adamowicz, and the Director of the Gunter Grassa Gallery, Iwona Bigos. Curated by Maria Sasin, the installation will be on display through September 15.